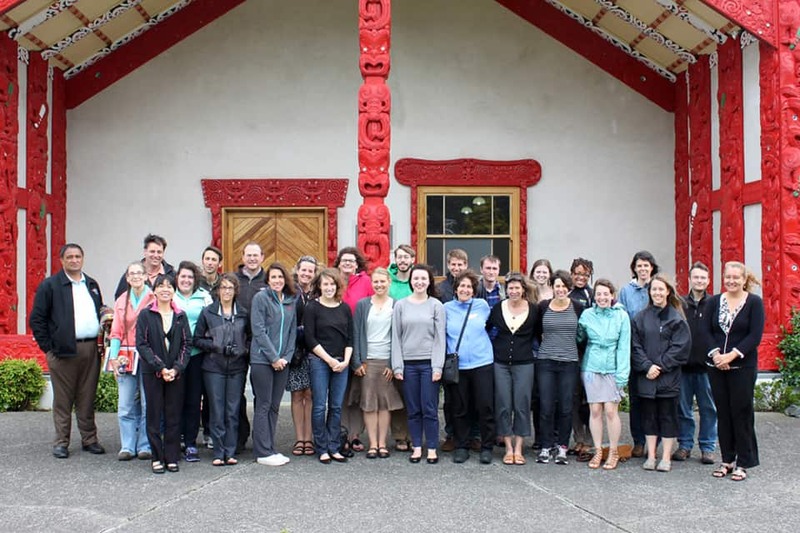 Fulbright New Zealand has begun its 65th anniversary year by welcoming 19 US exchange grantees to New Zealand. Since 1948 Fulbright New Zealand has granted more than 3,000 awards for New Zealanders and Americans to study, research, teach and present their work in each other’s country, with the aim of promoting mutual understanding between peoples of the two partner countries. This year’s grantees were welcomed with a pōwhiri and noho marae (overnight stay) at Waiwhetū Marae on Monday, beginning an intensive week-long orientation programme of seminars, cultural experiences and field trips designed to introduce them to New Zealand, Māori and Pacific history, culture and language, as well as New Zealand’s rich natural history and unique flora and fauna. Speakers included Fulbright alumni Jock Phillips, General Editor of Te Ara: The Encyclopedia of New Zealand and Professor Nigel Roberts from Victoria University of Wellington’s political science department. Labour Party MP Shane Jones, an alumnus of the Harkness Fellowships programme administered by Fulbright New Zealand, also addressed the group during a visit to parliament. As part of the orientation programme, grantees and their families were home-hosted by local Fulbright alumni for dinner and an overnight stay, connecting them with the valuable support network that the broader Fulbright community in New Zealand will provide throughout their exchange. For promising US graduate students to undertake postgraduate study or research in any field at a New Zealand institution, for one academic year. Alyssa Braciszewski from Huntingdon Valley, Pennsylvania will research the effects of nitrogen pollution and bleaching on sea anemones, at Victoria University of Wellington. Anton Chiono from Berkeley, California will research the inclusion of forests in cap-and-trade climate policy, at Victoria University of Wellington. Andrew Cole from Appleton, Wisconsin will compose music based on field recordings of natural, rural and urban areas of New Zealand, at the New Zealand School of Music, towards a PhD from the University of Missouri–Kansas City. Tali Horowitz from New York will research the role of professional development in creating culturally responsive schools, at Te Whare Wānanga o Awanuiārangi. Camille McCallister from Washington, DC will research health communication to Māori across different socioeconomic statuses, at the University of Auckland. Terri Motraghi from West Sunbury, Pennsylvania will research post-earthquake health and educational outcomes of young children in Christchurch, at the University of Canterbury. Tessa Scroggin from Ashland, Oregon will complete a PhD in Māori and Indigenous Studies, specialising in the cultural concepts and strategies used to advance Māori education, at the University of Canterbury. Jennifer Whisler from Peru, Nebraska will research the development of Greenstone digital library software, at the University of Waikato. David Zweig from Athens, Georgia will research the effect of temperature on the efficiency of denitrification bioreactors for agricultural effluent, at the University of Waikato. For a promising US graduate student to undertake postgraduate study or research in a field related to earthquakes and their repercussions, at a New Zealand institution for one academic year. Matt Hanson from Sandy, Utah will complete a Master of Science degree in Geology, specialising in 3D geochemical mapping of the Rotokawa geothermal zone, at the University of Canterbury. For US academics, artists or professionals to lecture and/or conduct research in New Zealand for three to five months. Jon Bray from the University of California, Berkeley will research the impact of liquefaction on critical infrastructure in Christchurch, and teach geotechnical earthquake engineering, at the University of Canterbury. Terrie Epstein from Hunter College will research young people’s perspectives of the Treaty of Waitangi, at Victoria University of Wellington. Kathy Fox from the University of Vermont will research restorative re-entry of offenders to the community, at Victoria University of Wellington. Cath Kleier from Regis University will research plant conservation in New Zealand, and teach global plant conservation, at the University of Otago. Katie O’Reilly from the University of Portland will research hormonal influence on activity and movement patterns of Little Blue Penguins, and teach conservation biology, at the University of Auckland. Larisa Warhol from Arizona State University will research digital multimedia resources for indigenous language revitalisation, and teach language revitalisation, at AUT University. For outstanding mid-career US professionals to research and gain first-hand experience of public policy at a New Zealand government organisation for seven months. April Ferrino from the Texas Legislative Budget Board will research regulatory support for the promotion of person-centered care in rest homes, at the Ministry of Health. Eileen Harrity from Chicago Public Schools will research the development of educational pathways to improve youth employment prospects, at the Ministry of Education. Mary Jo Kaplan from Kaplan Consulting will research social enterprise and innovative approaches to addressing social needs and engaging youth, at the Ministry of Social Development.